Bob Hodge is one of the greatest runners to come out of Lowell and a graduate of Lowell High (1973) and the University of Lowell (1990). He shares another story about growing up and running in Lowell. I love to play hooky, and in high school I quite excelled at it. More than playing hooky is the idea of it and all the things you might be doing or not doing looking out the window from work on the most beauteous days. I was reading Lonesome Traveler by local author Jack Kerouac,, and the feeling from the words reverberated through me, a shock wave that rendered me almost incapable of continuing the straight-line narrow path of expectation. For today I would return home to Butterfield Street in the Acre neighborhood of Lowell and head out for that run. I got to the door of our three-decker apartment, threw it open and sprinted to the top of the stairs, then stopped and listened through labored breathing for the sound of the door banging shut. I located the house key in the super secret hiding spot under the milk box and opened the door to the empty apartment. I changed quickly into my gear and reverently slipped on my new Onitsuka Tiger Cortez’s. I looked up at the clock in the kitchen to estimate the time of my run, but also the time that my Dad might get home and notice somehow that I had skipped school. I started out carefully through the crowded North Common, waiting for the taunts that would surely come from the hoodlums and juvenile delinquents around the hood. 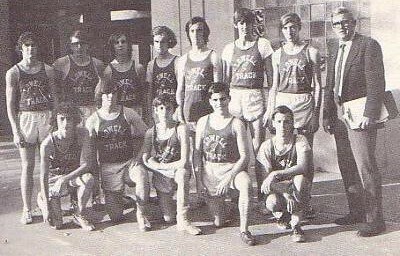 In 1971, it was uncommon to see even athletes running the streets in shorts and a T-shirt. Most of my neighbors and friends knew of my running exploits from the local Lowell Sun newspaper. They gave me a grudging respect, after all it wasn’t really a sport and you can’t be considered a real athlete! I hit the Textile Bridge and gazed out into the distance, the Merrimack River flowing downstream over the rocks past the mills, Lowell’s river the hardest working river in America’s Industrial Revolution. I continued up Textile Ave. to Mammoth Road out into Dracut and into the Lowell-Dracut State Forest. It was a fine crisp fall day, the leaves on the trees beginning to turn. I wondered what the team would be doing for practice, probably just an easy run now that we were in the middle of the season with two meets a week. I thought about upcoming races and my pace quickened and my mind became focused on the inner workings of my body, and I lost myself in the moment. I hammered down Varnum Ave. to the river and down and over the Pawtucket Falls Bridge and made my way home. My Dad’s car was parked out front, so I tried to think up a reason as to why I was home early, but could not think of anything convincing so I decided to go with the truth. I threw the weighted door open and sprinted up the stairs and opened the door to the apartment. Dad was in his chair with a newspaper and a Black Label, and since he barely noticed me coming in I checked the time on the kitchen clock and hit the bathroom quickly and no one suspected my hooky day. I had a more positive feeling of things in general after my “day of hodgie” had given me time to calm myself, think over my place in the Universe, and be confident in following my instincts. I didn’t know about endorphins then, but I was certainly feeling the effect. I also would like to remember Bob Hodge’s brother. Staff Sergeant William John Hodge from Lowell ,MA who was killed in action in Vietnam on February 28,1970 . He was 22 years old. His unit was B Company , 1st Battalion ,16th Infantry , 1st Infantry Division. He was awarded the Bronze Star Medal, posthumously.